What items of news stood out for you this week? The first one for me was that on Monday and Tuesday more than 4,000 refugees/asylum seekers and economic migrants landed in Italy from Libya. Four thousand in two days! That made over 24,000 since the beginning of the year, and the weather is now improving. Europe will have to share the burden with Italy. 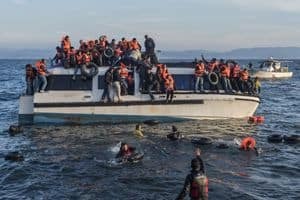 Hundreds of thousands will be making their way to Europe, all paying their way to the gangs who control the boats and the sea crossings. In terms of numbers this will be a greater problem that those coming from Syria, Iraq and East Africa via Greece and Turkey. What wisdom will be required of our governments to resolve this problem, what charity required of Europe to feed, clothe and house these desperate people. They are desperate. As we look at the dangers they must face to travel here we marvel at their courage and determination – but are overwhelmed by the choice we know they are making: to risk losing their lives to escape the misery, poverty and hopelessness they will know if they stay where they are. I think that if I were desperate as they are I would choose as they are choosing. I hope I would not resort to violence as we know some of them do, but I wonder how I would see the comfort and security of life in Europe in contrast to the poverty and misery of life in many parts of the world. The second item of news was the author of a book, interviewed on radio and television, on ISIS and their motivation. There is no answer, he says, because they hate all who are not of the same Islamic faith as they are – and are willing to kill hundreds of millions to “purify” the world in their own image of Muslim faith. Such news – and then there is the EU referendum, the closing down of our steel works, fears of unemployment, fears of those on benefits, human trafficking, drug trafficking, criminal gangs – and we wonder about our country as well as our world. We ask God to guide us.